Review by AllTheBestFights.com: 2018-09-01, pretty good fight between Pedro Guevara and Roberto Sanchez: it gets three stars. The former Wbc light-Flw champion Pedro Guevara entered this fight with a professional record of 31-3-1 (18 knockouts) and he is ranked as the No.9 super flyweight in the world (currently the #1 in this division is Srisaket Sor Rungvisai). He lost to Ken Shiro last year (Ken Shiro vs Pedro Guevara) but he came back to win with Angel Guevara in 2018. His opponent, Roberto Sanchez, has a boxing record of 17-1-0 (11 knockouts) and he entered as the No.77 in the same weight class. He suffered his only loss when he faced Jose Vega Ochoa in 2015, since then he has won 12 consecutive bouts defeating Mauro Loreto in his last one. 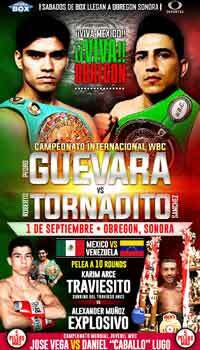 Guevara vs Sanchez is valid for the vacant WBC FECARBOX super flyweight title. Watch the video and rate this fight!